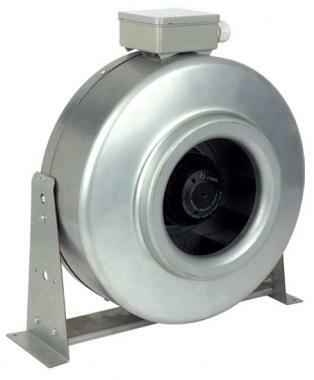 The SDX Euroflow in-line centrifugal duct fans shall be as supplied from Roof Units, designed around an efficient backward curved centrifugal impeller and external rotor motor, to ensure a compact design, high performance and low sound levels. The in-line fan shall be constructed from steel and incorporate an aerodynamically designed airflow guide vane, ensuring maximum performance from the unit. All models are to have 25 or 30mm inlet and discharge spigots, for ease of installation and shall come complete with mounting feet for horizontal or vertical mounting. The SDX range is available in twelve models, sizes 100, 125, 150, 160, 200, 250 & 315mm diameter, with sizes 150 to 315 available as a standard or high performance in-line centrifugal duct fan. The range shall provide a performance from 0.01³/s to 0.435m³/s with a maximum pressure development of up to 500 Pa. The SDX range is suitable for the extract of clean air only. It is not suitable for extracting or transporting grinding dust, soot, explosive or other aggressive gases etc. The impellers shall be aerodynamically designed centrifugal backward curved type, manufactured from steel or polyamide. The motor and impeller shall be factory matched, statically and dynamically balanced in two planes to ISO 1940, Grade G 6.3. All sizes from 100 to 315 shall be protected to IP44 in accordance with BS EN 60529:1992. With motor insulation Class B, suitable for operating temperatures from -15°C to +40°C and atmospheres up to 95% RH. The range shall incorporate maintenance free external rotor motors, fitted with sealed for life ball bearings, ideally suited for speed control by electronic or voltage reduction. The motors shall be wound to suit a 230V/1PH/50Hz electrical supply, with all motors permanent capacitor type to optimise efficiency. HOT SPOT protection by means of a thermal contact switch incorporated within the windings shall be provided to prevent motor damage due to overloading/overheating. An IP44 terminal box shall be supplied with all models with 20mm entry. The fan performance shall be in accordance with tests to BS848 Part 1 1980, with the fan sound levels measured in a reverberant chamber in accordance with BS848 Part 2 1985. Design and manufacture shall be in accordance with the standard for quality management systems BS EN ISO 9001:1994. Specification: 100mm diameter Motor Insulation Class B, protected to IP44 Operating Temperatures from -15°C up to +40°C HOT SPOT Protection Suitable for speed control using electronic or Voltage controller Quality Assurance to BS EN ISO 9001:1994 Performance tested to BS848 Part 1 1980 2 Year Warranty. Specification: 125mm diameter Motor Insulation Class B, protected to IP44 Operating Temperatures from -15°C up to +40°C HOT SPOT Protection Suitable for speed control using electronic or Voltage controller Quality Assurance to BS EN ISO 9001:1994 Performance tested to BS848 Part 1 1980 2 Year Warranty. Specification: 150mm diameter Motor Insulation Class B, protected to IP44 Operating Temperatures from -15°C up to +40°C HOT SPOT Protection Suitable for speed control using electronic or Voltage controller Quality Assurance to BS EN ISO 9001:1994 Performance tested to BS848 Part 1 1980 2 Year Warranty. Specification: 200mm diameter Motor Insulation Class B, protected to IP44 Operating Temperatures from -15°C up to +40°C HOT SPOT Protection Suitable for speed control using electronic or Voltage controller Quality Assurance to BS EN ISO 9001:1994 Performance tested to BS848 Part 1 1980 2 Year Warranty. Specification: 250mm diameter Motor Insulation Class B, protected to IP44 Operating Temperatures from -15°C up to +40°C HOT SPOT Protection Suitable for speed control using electronic or Voltage controller Quality Assurance to BS EN ISO 9001:1994 Performance tested to BS848 Part 1 1980 2 Year Warranty. Specification: 315mm diameter Motor Insulation Class B, protected to IP44 Operating Temperatures from -15°C up to +40°C HOT SPOT Protection Suitable for speed control using electronic or Voltage controller Quality Assurance to BS EN ISO 9001:1994 Performance tested to BS848 Part 1 1980 2 Year Warranty. Specification: 150mm diameter, High performance Motor Insulation Class B, protected to IP44 Operating Temperatures from -15°C up to +40°C HOT SPOT Protection Suitable for speed control using electronic or Voltage controller Quality Assurance to BS EN ISO 9001:1994 Performance tested to BS848 Part 1 1980 2 Year Warranty. Specification: 200mm diameter, High performance Motor Insulation Class B, protected to IP44 Operating Temperatures from -15°C up to +40°C HOT SPOT Protection Suitable for speed control using electronic or Voltage controller Quality Assurance to BS EN ISO 9001:1994 Performance tested to BS848 Part 1 1980 2 Year Warranty. Specification: 250mm diameter, High performance Motor Insulation Class B, protected to IP44 Operating Temperatures from -15°C up to +40°C HOT SPOT Protection Suitable for speed control using electronic or Voltage controller Quality Assurance to BS EN ISO 9001:1994 Performance tested to BS848 Part 1 1980 2 Year Warranty. Specification: 315mm diameter, High performance Motor Insulation Class B, protected to IP44 Operating Temperatures from -15°C up to +40°C HOT SPOT Protection Suitable for speed control using electronic or Voltage controller Quality Assurance to BS EN ISO 9001:1994 Performance tested to BS848 Part 1 1980 2 Year Warranty.